In a recent poll, we asked readers, "Which entrepreneur do you admire most?" The winner, hands down, was Oprah Winfrey, with nearly double the votes of Bill Gates and four times Richard Branson. In a career filled with firsts and superlatives, Oprah has managed to amass a sizable fortune, become one of the most powerful people in the entertainment industry, and yet maintain a sense of humility and compassion. Oprah was born in a small town in Mississippi in 1954 and raised in Nashville, Tennessee, beginning her career in broadcasting at age 17 at radio station WVOL. By 19, she was anchoring the news at WTFV-TV, both the first African-American woman and the youngest person ever to do so. In 1976 she moved to Baltimore, where she co-anchored WJZ-TV's Six O'Clock News. She soon made the switch to doing talk shows, hosting the local People Are Talking. In 1984, Oprah relocated to Chicago to host AM Chicago. Within just one month, it had surpassed Donahue as the number one local talk show, and within a year it was renamed The Oprah Winfrey Show. A year later, it entered national syndication and became the highest-rated talk show in TV history. It aired for 25 seasons before going off the air in 2011 and remains the highest-rated talk show on American television. It won dozens of Emmys, was seen by an estimated 30 million viewers a week in the United States and was broadcast internationally in 111 countries. Not content to work for someone else, Oprah founded her own production facility in 1988, Harpo Studios (that's "Oprah" spelled backward, not a Marx Brothers reference). Since then, it has grown into Harpo, Inc. which employed about 250 full-time staff at its peak in television and film production, magazine publishing and online media, though that number dropped sharply to just 20 employees in 2015. She is also co-founder of Oxygen Media which operates the Oxygen Network, a cable network for women reaching more than 54 million viewers. In 1985 Oprah gave a breakout performance as "Sofia" in Stephen Spielberg's The Color Purple, garnering both Golden Globe and Oscar nominations. She has also acted in several made-for-TV movies. In 1990, she founded Harpo Films to work on projects based on contemporary and classic literature, such as 1998's Beloved, adapted from Toni Morrison's Pulitzer Prize-winning novel and co-starring Oprah and Danny Glover. Harpo also has a long-term deal with ABC to produce the "Oprah Winfrey Presents" telefilms. In 2000, Oprah launched O, The Oprah Magazine in partnership with Hearst Magazines, a monthly magazine that has become one of today's top women's lifestyle publications. It now has a circulation of more than two million monthly readers (more than Martha Stewart Living or Vogue) and Fortune called it "the most successful start-up ever in the industry." In 2004 she launched O at Home, a seasonal home design magazine. With thirteen million users per month generating 75 million page views, Oprah.com is one of the top women's lifestyle websites. The site covers a variety of topics and provides in-depth resources in relation to the show. It'S also the home of Oprah's Book Club, now the largest book club in the world with more than half a million members. In addition, the site features Live Your Best Life, a multimedia section highlighting Oprah's personal stories, life lessons, and an interactive workbook. Oprah lives a remarkably private life for a public figure—by design. Harpo employees are barred from talking or writing about her personal, business and company affairs for the rest of their lives. Only once did a former employee, Elizabeth Coady, challenge it in court. Coady lost and Oprah's business and personal life remain remarkably private. Her companion, Stedman Graham, is a prominent management and marketing consultant with two best-selling books to his name. In 1987 Oprah created The Oprah Winfrey Foundation "to support the education and empowerment of women, children, and families in the United States and around the world." The charity has awarded millions of dollars to organizations throughout the world to improve education and healthcare. In 1997 she founded Oprah's Angel Network to inspire people to make a difference in the lives of others. So far the group has raised $80 million from audience donations and some celebrity contributors. Although she's a billionaire (and the first black woman to achieve that status) with a long list of business accomplishments and awards, Oprah told Fortune Magazine, "I don't think of myself as a businesswoman. The only time I think about being a businesswoman is now, while I'm talking to you. There's this part of me that's afraid of what will happen if I believe it all." She's turned down invitations to join the corporate boards of AT&T, Ralph Lauren, and Intel. But by most people's accounts, she's the most powerful woman in the entertainment industry. As Patricia Sellers put it, "Oprah's life is the essence of her brand, and her willingness to open up about it on daytime TV helped win the enduring trust of her audience." Oprah has maintained strict control of that brand, turning away countless requests for her to lend her name to a wide variety of products. Everything with her name on it is put out by her company under her direct supervision. Even the deals with ABC, Oxygen Network and Hearst Magazines are basically distribution deals—she retains full control. She owns 90 percent of Harpo's stock. Oprah does, however, have a top-notch behind-the-scenes partner managing the day-to-day running of the business. Jeff Jacobs, an entertainment lawyer who she originally approached to help with her AM Chicago contract, is the president and 10 percent shareholder of Harpo, Inc. He also acts as her agent and manager for her movie deals. It's never been all about money for Oprah. 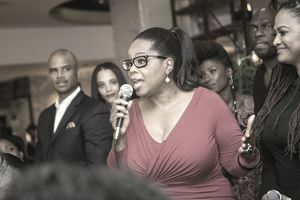 From her philanthropic efforts to the inspirational and educational nature of her shows to her book club and her Live Your Best Life program, it's clear that Oprah is all about two things: living a great life for yourself and making a difference in the world. She seems to have mastered both.